Check out this sweet article that appears on the front page of Ironman.com today on my Ultraman buddy Jason Lester. I can’t say enough about this guy. 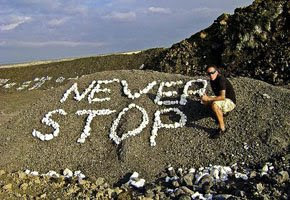 I had the honor of getting to know him in Kona, and he never ceases to inspire and amaze me. Jason Lester was nearing the end of day two of the 2008 Ultraman World Championships. He was 160 miles into a 170 mile bike ride on the Big Island of Hawaii, clinging to his bike with one hand, working his brakes on the steep, winding descent with two fingers, while crosswinds repeatedly blew him across the road. Every athlete who has competed in the Ford Ironman World Championship, or who has watched coverage of the race on television, knows of the legendary “road to Hawi.” Slicing like a blade through barren volcanic plains, the narrow strip of asphalt transports suffering athletes through undulating heat and body-pummeling crosswinds along the sparkling northwest coast of the Big Island of Hawaii. There’s a second road to Hawi that escapes the attention of most Ironman fans. Rising from the ranch town, Waimea, it winds like a serpent up and over the rippling flanks of the Big Island’s oldest volcano, Kohala, romping along through the birth place of the winds that each year haunt even the strongest Ironman World Championship competitors. Here, the Ultraman World Championship course requires cyclists to endure switchback after endless switchback through cloud-dusted hillsides. As Lester had ascended toward the peak of the mountain, a screaming tailwind carried him and his fellow competitors along at speeds of more than 20 miles an hour. The road bent down and those tailwinds became crosswinds that blew through scraggly tree stands and bore down on everything on their path. Calorie-depleted, with muscles from his neck to his ankles spasming and cramping, Lester battled his way against the invisible demons to the day two finish line in Hawi. He’d made it in just over 10 hours. A remarkable feat for any endurance athlete on the planet, made more so by the fact that Lester’s right arm is paralyzed. Lester has been an athlete all his life. Growing up, he took to one team sport after another, including football and baseball. He was hit by a car at 12 and was fortunate to survive the accident that left him with 21 broken bones, a collapsed lung and a paralyzed right arm. With incredible determination, Lester returned to sports as a teen, even with the paralyzed arm. A high school teacher who was training for the Ironman World Championship inspired Lester to try multisport events. It didn’t take long before he was a top duathlete and for years he raced biking and running events. Then, in October 2004, he happened to be visiting the Big Island on the day of the Ironman World Championship. 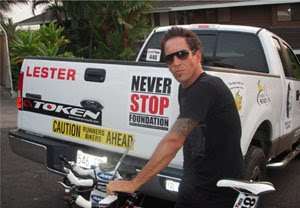 By the end of 2006, Lester had left behind a successful career in California and moved to Kona. He signed up for the 2007 Ford Ironman Arizona, although he still hadn’t managed to swim the length of a pool. 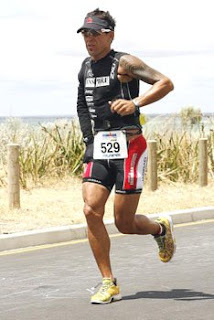 The next challenge came at Ironman Western Australia last year, with a 1:35:00 swim and a race PR of 11:48:06. There, Lester met his current coach, Dave Ciaverella, who offered Lester something other coaches had failed to do – a plan to prepare for an even larger challenge – the 2008 Ultraman World Championships. Held each year on the Big Island of Hawaii over Thanksgiving weekend, the Ultraman World Championship challenges 35 of the world’s most rugged endurance athletes to 320 miles of racing over three days. Day one includes a six mile swim starting from the famed Kailua-Kona Pier. Competitors swim out to the turn-around buoy for the Ford Ironman World Championship and then just keep on going, through five more miles of ocean swells and currents. They top off day one with a 90-mile bike ride to Volcano. Day two is a scenic, undulating 170-mile bike ride from Volcano to tiny Hawi. On day three, the Ultraman athletes put on their running shoes for a double-marathon from Hawi back to Kailua-Kona, along the same broiling route that Ironman competitors bike in October. Although other physically challenged athletes have attempted to complete the Ultraman World Championship, none had ever succeeded. Lester decided to become the first. With the Ultraman just six weeks after the Ironman World Championship, Lester says he did not race all out. Instead, he “really tried to enjoy it, enjoy every moment.” Lester still managed a 1:35:56 swim and a 13:07:21 overall time, placing first in his division. Two days later, Lester was training again, preparing for the Ultraman. On the Friday after Thanksgiving, he walked into the clear, blue Pacific Ocean at Kailua Pier for the start of the race. Despite ocean currents that added hours to some of the swimmers’ times, Lester managed to make the swim cut-off and bike one-handed through rain and mountainous ascents, finishing in the darkness in Volcano within the race’s allotted twelve hour time cut-off. Day two finished with Lester’s charge up and over Kohala mountain and his refusal to give in to the Big Island’s strongest winds. On Day three, Lester ran the same course he’d ridden six weeks earlier to return to Kailua-Kona, finishing the double marathon under Hawaii’s relentless sun in just over ten hours. All told, Lester completed the Ultraman World Championship in 24th place, racing just over 32 hours in three days and becoming the first physically challenged athlete to complete the event. Lester’s most amazing story from Ultraman came during the swim. Halfway through, Lester ran into a pool of jellyfish. Tentacles wrapped around his neck and down the length of his swimming arm and he began to have trouble breathing. A rescue boat plucked Lester from the water and, after checking him out, told him they were going to have to call 911 and bring him to shore. Eighteen months of training and sacrifice flashed through Lester’s mind and he did what came naturally. He jumped out of the boat, back into the same pool of jellyfish, and swam for all he was worth. “I refused to allow that to be the ending,” says Lester. Congratulations to a man who, no matter what script he’s handed, writes his own ending.